It’s been exactly a month since I touched down in South Korea. I thought I’d tell you a little about my average day. A Day in the Life of a Teacher Abroad. When you’re working in a hagwon, just like when you’re working in most places I guess, there is a routine to follow. It’s not a bad routine, but it does mean that most travel and exploration has to be kept to the weekend or national holidays. Luckily the days and weeks tend to fly by faster than a bat on speed and before you can blink you’re planning your next Friday night. This is an account of my average weekday and my routine. Let’s say it’s Monday. I don’t mind Mondays, I like going to work so it’snot too much of a bummer. If I’m good and get up when I’m supposed to then I’m out of bed around 10.30am and heading for the shower. That probably sounds luxurious to most but the day finished pretty late and I don’t like mornings. Either way, as I say, if I’m good I’m good I’m up and in the shower by 10.40pm. That’s if I’m good. Unfortunately for me, I love sleep, really love sleep. So by 11.00am I’m usually still in bed, giving myself a multitude of perfectly good reasons not to get up, trying to justify another 5 minutes. I’m pretty adept at this, even the act of thinking of excuses buys me an extra two minutes. These solid and well thought out ideas usually sound something like this, ‘I ironed my shirt yesterday, so I don’t need those ten minutes’, or, ‘Joe just got out the showers, so I better wait for a minute or two so the water can warm up’. And sometimes, ‘It’s ok, I don’t need breakfast/ I don’t need to have a shower’. It’s when these thoughts strike that I know I can’t stay in bed a microsecond longer. So I flop out of bed and shuffle, moaning and zombie like, to the shower. Shower sorted and I’m packed and out the door. Breakfast is usually in Tomato Kimbap. It’s our local and we go there for most meals. The staff are friendly and don’t speak a word of English, but I think they like us. Our fry up is Kimchi Bokenbap (Kimchi fried rice) which comes with an egg, sunny side up perched on top. Closest I’m gonna get to a Full English in Gansoek. That eaten we’ll head either to work, if we’re playing it close, or over to the other side of the station for a coffee if we’ve got time. I usually get myself a couple of Kimbap (Korean sushi) at Tomato Kimbap to eat at lunch too. I’m in work by 12.30pm. Joe and Scott don’t have to be in till around 1, but I get the honour of having a one-to-one meeting with the school’s academic director every morning. Hopefully this will finish in February. Then I have a couple of hours to plan and prep for my lessons and do anything else I need to do like mark the students weekly diaries. These few hours are actually the longest part of my day, once classes begin at 3 time starts to move in double time. The class schedule works as follows. Mondays and Wednesdays follow the same timetable and so do Tuesdays and Thursdays. Fridays alternate between the Monday and Tuesday schedule. On the days when I’m on a Monday schedule, a Korean teacher is teaching my Tuesday and vice versa. 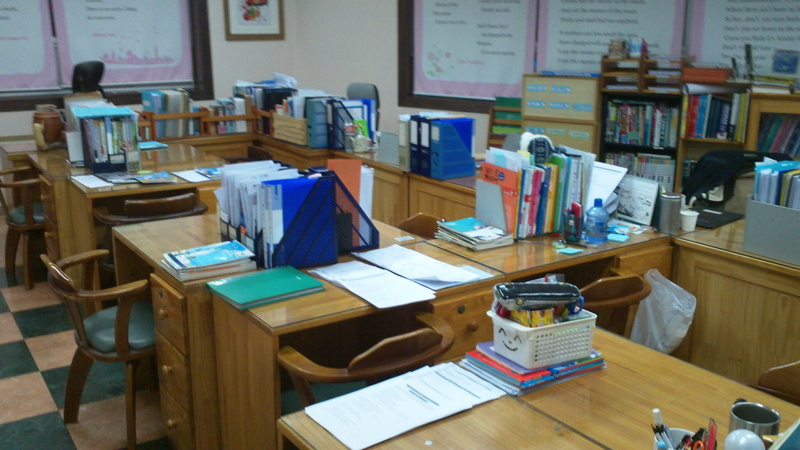 The Korean teacher covers vocabulary, translations and writing tasks. I cover vocabulary, speaking and grammar in my classes. The only exception to this is my S1 class, who are all mine. With these guys I teach everything, and I teach them every day. Luckily they are one of my favourite classes. All the classes work on the same time plan. The first five minutes are for greeting, I’ll ask the kids what they did on the weekend/what they’re doing next weekend/what they did last night. Anything really to get them warmed up and talking. The next ten are for storybook reading. I call and they repeat each line and then read individually. I sign the page so they can show their parents what their reading and if there’s time well play a game like Hangman (now called Bungee Game, the director didn’t like the name hangman, she doesn’t really like games). Then it’s onto workbook tasks for the rest of the lesson, with grammar use activities and game dotted about. Class finishes at 53 minutes past on the dot (don’t ask why) and then there’s a few minutes to grab some food, bite sized Kimbap is ideal when you’ve got literally two minutes, then it’s off to the next class. It’s no wonder 6 or 7 hours of teaching pass in a flash. Most of my classes are pretty good. One is not, when I have 6D it feels like the world goes into slow mo mode. It’s a big class and it’s so boring, the kids are just boring. The nice ones are quiet and the three disruptive boys are tiresome. They don’t want to do activities, they don’t even want to play games. Luckily they are the only class I don’t like. Most I love. My last classes on both days are one-on-one. I see David, a 16 year old who’s working towards a special test in a few weeks and I’m tutoring him to pass it. It’s not the most interesting 53 minutes, but he’s is a nice kid so it’s ok. The other one is a little different. It’s with a younger boy, maybe about 9 or 10, called Jung. He’s very active and can’t concentrate for longer than 15 minutes without playing a game of some form. He apparently has ADHD, but I’m not sure about that. That’s a whole other debate that I’m not getting into. I clock out at 9.15/10.15 in the evening, depending on whether its a Monday schedule or a Tuesday. Joe, Scott and I usually don’t finish at the same time so I stop by Tomato Kimbap, say hi to the ladies and grab some dinner and then head home. In the evening we stick on a movie, right now we’re watching 28 days later. Not the most entertaining evenings but it’s nice not to worry about anything after work and have a chance to chill out after work. The real fun happens on the weekends. Sometime on a weekday we’ll go and play screen golf (more on that later) or head to Bupyeong for a few drinks. So that’s a day in the life of a teacher in Korea. Not bad to be honest I enjoy teaching, the kids are fun, the staff are nice and the days really do fly by. « Got plans this year? Don’t hold back. Korea is definitely a ‘pop out for a beer’ place. Everyone here is a big drinker and night life is huge, especially in Seoul. The beer is rice based so gives a tremendous hangover, but it’s alright stuff, and a couple of Tylenol before bedtime almost completely eradicate the headache the next morning. i’m glad you like mondays, you have got a lot of them to come!!! Thanks for the reminder. It might just be that the honeymoon phase of teaching hasn’t passed yet. Guess we’ll have to wait and see. Thanks. I’m really enjoying being a teacher so far. It’s tough but it’s fun. Thanks for the offer too, I’m planning on exploring some more of Incheon soon.